Arrived expecting RV Parking to be free. 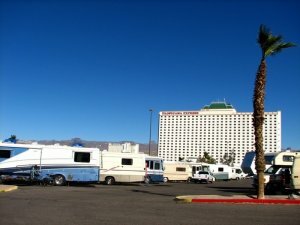 Very disappointed to see there's a $7 per night fee to park your RV overnight. We didn't discover this until we had already parked and setup. Regardless of what all the signs state, you need to check-in at the hotel counter and pay your fees. Then you need to go to the AVIS car rental booth and get your windshield pass. Fairly quiet at night with security driving through periodically.